Farewell to women's history month! Hey, it's a two-story day! Yay! Pick up a paper Ypsilanti Courier if you'd like to read "Ypsi 'Factory Girls' predated Rosie the Riveter." It was fun to research. A final salute to women's history month. Ma'am, May I ask about your Underwear? State officials canvassed thousands of women in 1892, asking one question in particular that probably earned them a hearty slap on the face. 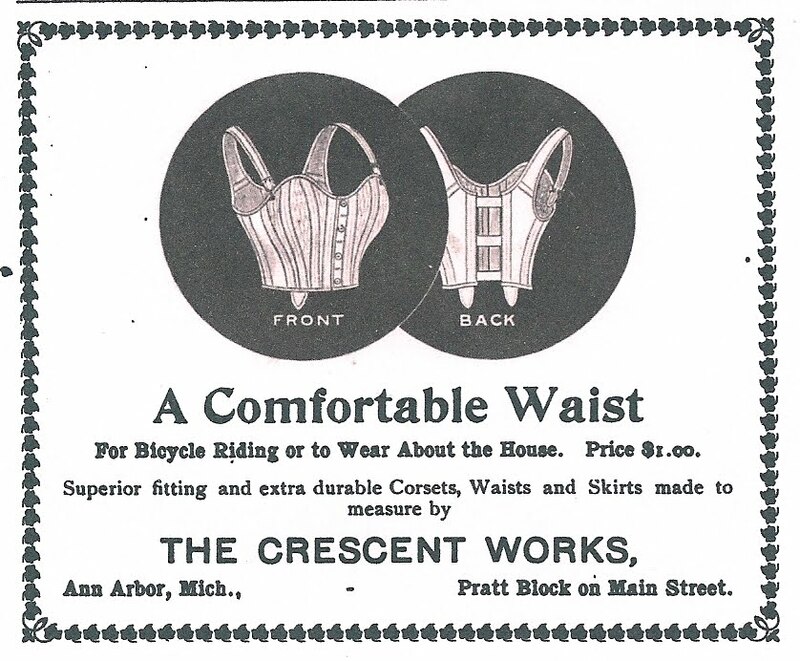 Yet they kept at it, published their data, and thus immortalized one of the stranger tidbits of Michigan history. 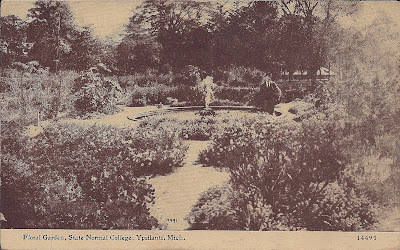 A look at a onetime floral garden on the EMU campus. 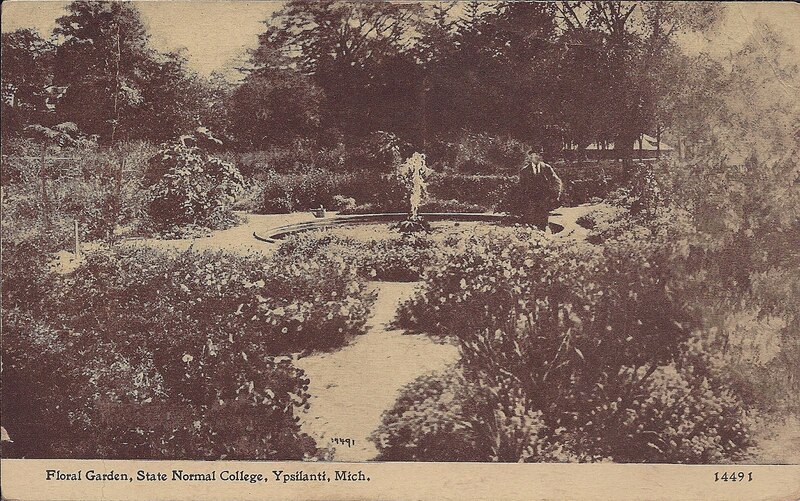 I don't believe these are the onetime "science gardens" in which students practiced botany. I know for sure the fountain is not the large student-given fountain that used to stand near Cross Street. At ant rate, a sepia glimpse of a campus past. "Says Dr. Willard, "What is disease in its entity? Sin. What is sin? God's broken laws, but let us say Nature instead of God." But why say Nature? Is nature God? 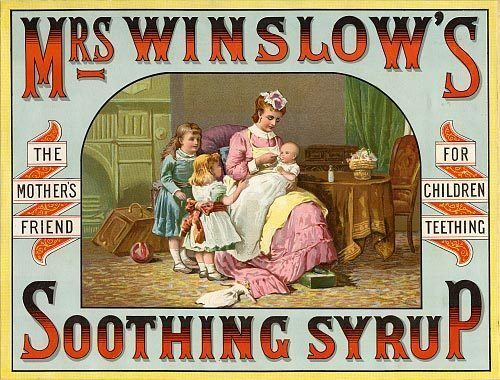 The physician of the future is to have authority "to regulate all matters pertaining to health," i.e., to drain swamps, to abolish graveyards, funeral processions, corsets, French heels, alcohol, tobacco and houses of ill fame, etc. "He will see that medical colleges give thorough instruction in sanitary science, and that none but clean men and women, pure physically, pure morally, receive their degree." The physician of the future certainly will have his hands full, and, as is said in this degenerate age, be a "boss." If it were possible for reformers, medical or lay, to make clean and pure all foul and dirty places, habits, men and women, we should say, All Hail! But they can't do it. It is against Dr. Willard's major premises, that the root of all the trouble is "sin." If reformers have the money they can drain swamps, etc., but they cannot cure "sin" by hygienic measures or statutes. If they can, then they should hasten to abolish the Church, which teaches something very different." Newest chapter in an ongoing serialization of the 1888 diary of Abba Owen, daughter of Ypsilanti mineral water baron Tubal Cain Owen and Anna (Stowe Foote) Owen. The Owens lived in a now-vanished house near the current day Roosevelt School building on EMU, where Tubal also had his magical and very profitable well. Saturday March 22nd: A pleasant day. 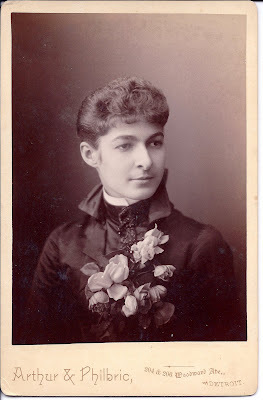 Miss Gray and Margarete Gilbert spent the afternoon and took tea and spent the evening. We took pictures in the afternoon and in the evening we had scherades [charades?] and had a lovely time. Monday March 24th Real chilly. Mrs. Moore and Eber returned to Ann Arbor this morning. Suderer did not come tonight. Tuesday March 25th: A windy disagreeable day. I went over to the Sappho club. Rich and I went over to a pupil's recital at the conservatory this evening. Wednesday March 26th: About same as yesterday. Eber came home to-night. THursday March 27th: I went up to Normal Chapel this morning. Mrs. Pease, Mrs. Hodge, Mr. Seringer and Mr. Breresford of Detroit sang a quartet "God is a Spirit"; the choir also sang. I am taking now a musical course having Adv. voice culture Structure [?] of music and Adv. vocal music. It keeps me pretty busy. Took mama down to society and then went to church. Friday March 28th: Terrible storm commenced last night, snowed and the wind blew all night and all to-day. The wind is blowing terribly. About 4 in. of snow on the ground. School closes to-day for a week's spring vacation. Saturday March 29th: Stormy. Louise Snyder called here this afternoon. I had not seen her in nearly two years. She is in Detroit studying music. Grandpa went to Plymouth this morning. Tune in next Tuesday for another look at Abba's doings. Sunday March 16th: A pleasant but windy day. Mr. Moore, Eber, and I went to lunch this morning Mr. Post made us a call as usual. I wrote to Nellie Whiting. Monday March 17th: Pleasant. Ebe and Mr. Moore went to Ann Arbour this A.M. Mr. Sudirk was here to-night. Tuesday March 18th: Looked as if it would rain all day. Mama and I went to Sappho this A.M. Papa is going to Chicago to-night. Made grandma a visit this afternoon. Wensday, March 19th: A damp day. Richard and I played a violin duet ("Souvenir d'Alamange arranged by Prof. Suderer) at a musical given by the ladies of the Congregational Church at Mr. Child's. Friday March 21st: A lively warm day. Margarite Gilbert and I rode all the afternoon. Mr. Moon came home with Eber to-night. This humble blog is gonna be dark for a few days since Dusty D is preparing for her presentation at the state history conference on Fri-Sat in Troy. Highlight: keynote speech by 77-year-old Fred Meijer! Lots of tweaking of my Powerpoint slides and last-minute fact-checking. 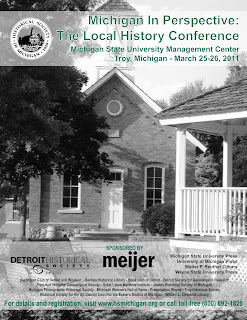 It should be fun; last year's conference in Dearborn, which DD and husband attended, was informative and interesting. So come Saturday the pressure should be off and I'll be back to report on how things went. 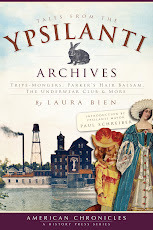 The tale of an ordinary immigrant from Czechoslovakia (Bohemia then) who seeks a better future in late 19th-century Ypsilanti. Also, tangents on the reluctant American acceptance of antisepsis and the higglety-pigglety structure of onetime local public welfare programs. Plus related Mystery Artifact. It's maple sugarin' time when the daytime temp is around 40 but the nights are around 20. 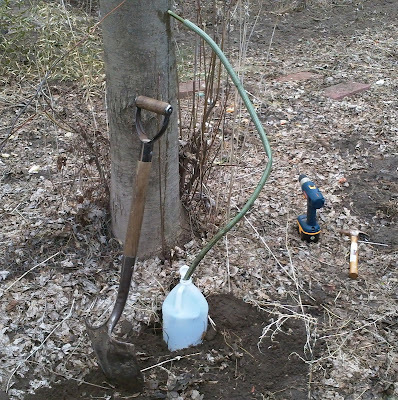 That's the last few days, so now that our backyard maple tree is just barely big enough to tap (10" diameter) I decided to tap it for the first time. I don't have the metal spiles (spigots you hammer into the tree) or the hangy-buckets or the lids for the hangy-buckets and I refuse to buy stuff for every darn thing I feel like doing. So I decided to go DIY. I figured that old-time Vermont farmers miles from the general store wouldn't travel for or maybe even have money for store-bought spiles and likely made their own. So I looked around for a hammerable tube. 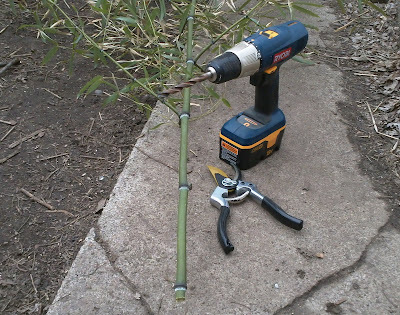 Aha--I DO have backyard bamboo! I cut a stem a bit over 1/4 inch wide. I cut one section about 6 inches long between joints, reamed it out manually with a narrow drill bit, and blew out the papery lining. The bamboo was a bit thicker than my drill bit, so I whittled a very slight taper on one end. 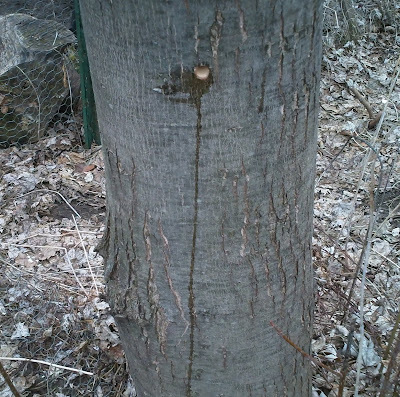 I drilled a hole about 1 and 1/2 inch into the tree, on the sunniest north side and slanting upward into the tree to aid drippage. I wanted to use my old-timey hand-crank drill but the bit I wanted wouldn't fit, so I used the cordless drill. IMMEDIATELY the hole began to drip! 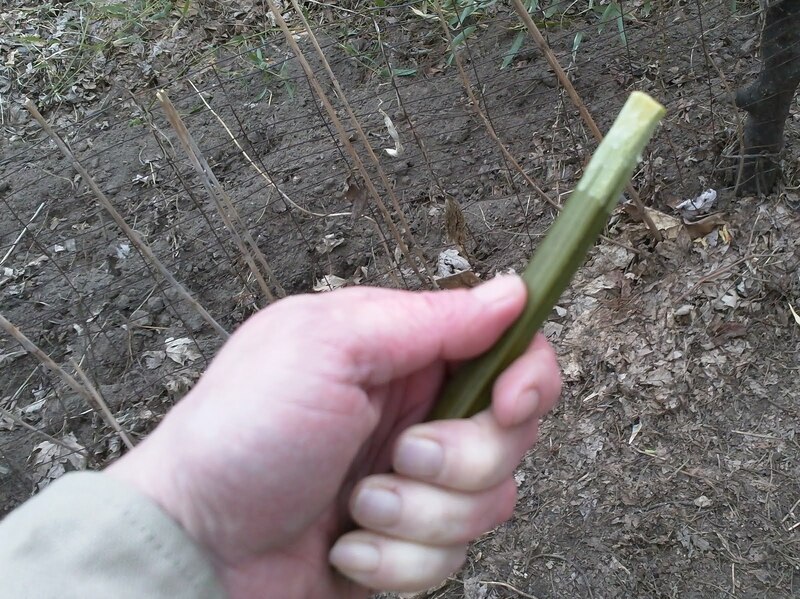 I hammered in my bamboo spile and it worked--sap began dripping from the end at the rate of 1 drop per second. 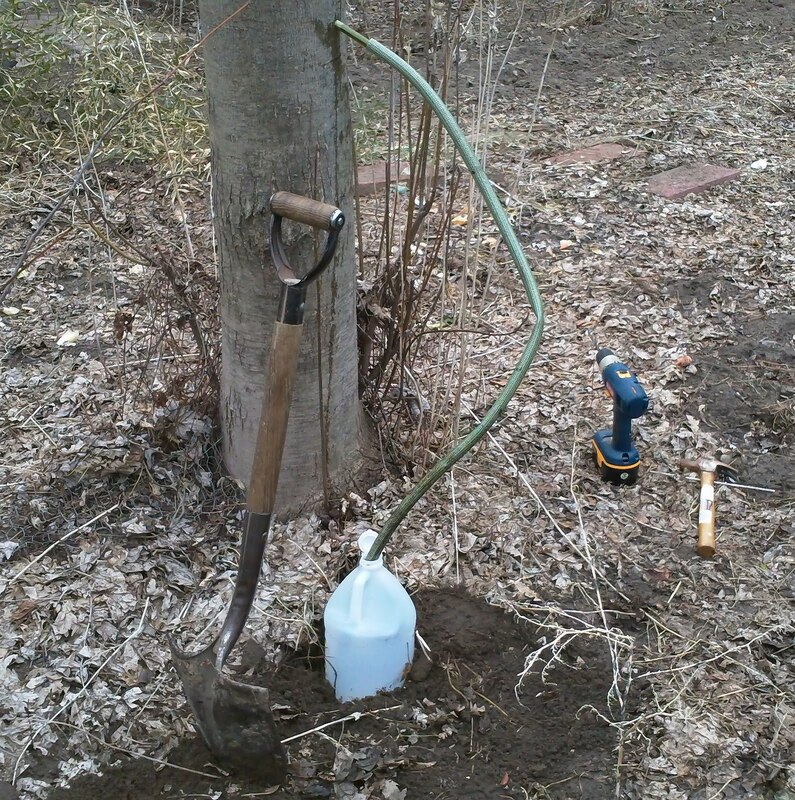 Instead of the hangy-bucket, I repurposed a section of old broken garden hose, trimmed its ends, washed and rinsed it, and fed it into a washed vinegar jug. Dug the jug into the ground a bit to keep it from tipping. The sap was dripping into the jug successfully. Here's hoping I'll get enough to boil down into syrup to surprise my husband! One person in this Czech immigrant family of onetime Ypsilanti residents had his feet amputated by a train one fall day. A story about this person is coming up in the Chronicle. 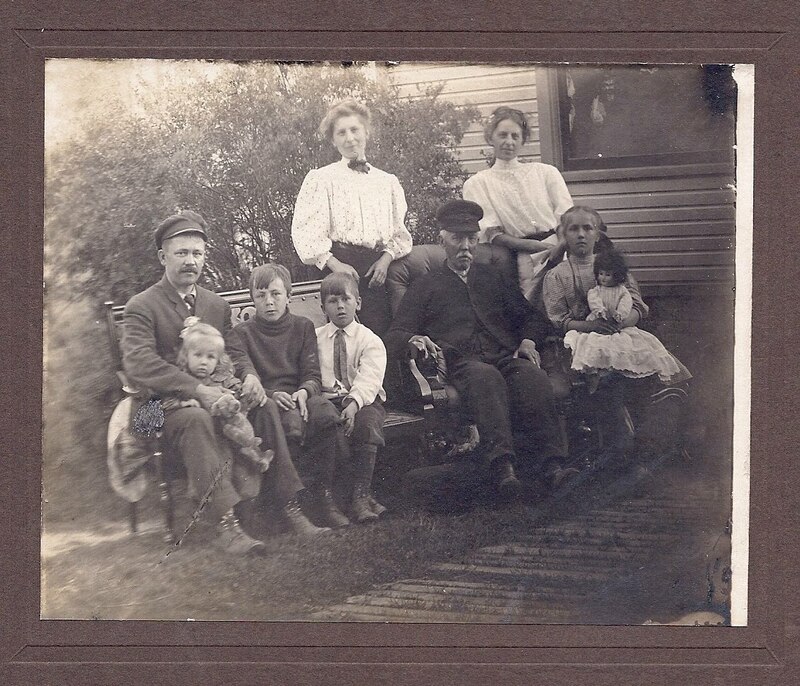 Can you tell which of these people in this 1908 photograph suffered that terrible accident? Saturday March 8th: A lovely day. Ebe took mama and I over to the river to see them put up ice; it was very interesting. It turned so warm this afternoon that they had to stop about 3 o'clock. mama, grandma, and I went down town and to church. 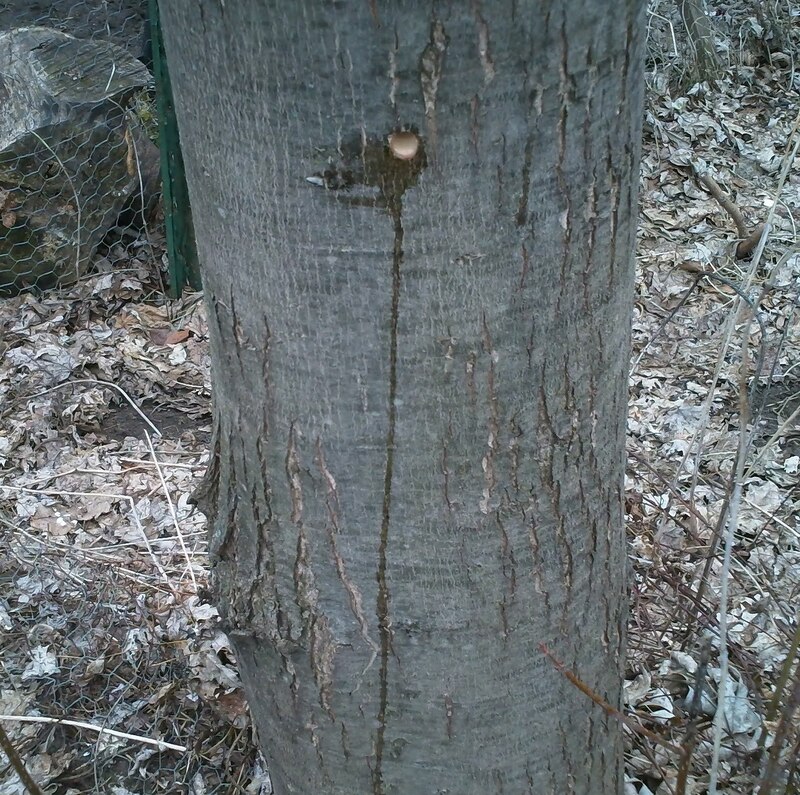 Rich saw a red-headed woodpecker this morning. Sunday March 9th: A very pleasant day. Went to church. The men commenced putting up ice last night at twelve o'clock and worked until eleven this A.M. as it was a case of necessity and then and then began to-night again and will work until to-morrow morning. Monday March 10: It has snowed and sleeted all day and very disagreeable. Eber came home to-night so as to attend the concert at the Normal Hall. Tuesday March 11th: Another rainy day. Went to hear the Bell Ringers last night and it was splendid we all enjoyed it very much. Mama got a ticket this morning to hear Jaunschweck [sp?] to-night. Wensday March 12th: A dark gloomy day. Mama, Rick and I went to hear Jaunschweck we enjoyed and liked her very much but not as much as we did Reha. The play was Mig Mirrelles. Jann took the part of Mig Mirrelles the old gypsy witch. Thursday March 13th: A pleasant day, just like summer, the streets are awfully muddy. mama went to society and then went to the meeting of the Chapel Guild; they voted to turn their money over towards the church house. Luderer [sp?] came this evening. Friday March 14th: Quite a little colder. The thermometer stands to-night 6 degrees. The entertainment committee of our Auxiliary Society had a meeting this afternoon to decide about the Easter sale afterwards we all went to church. Mr. Moore came home with Eber to-night. Saturday March 15th: It has snowed off and on all day and is very cold. We darkened up the long hall upstairs and Rick and Mrs. Moore took pictures (Rick has a new camera) and developed them upstairs. Margarite Gilbert came over in the afternoon and brought her new camera and Mr. Moore taught us all how to take pictures and we had a splendid time and lots of fun. "One form of what might be termed 'athletics' in which our college girls are trained and in which some excel, is aesthetic dancing. With its combined vigor and grace it affords a popular type of exercise. 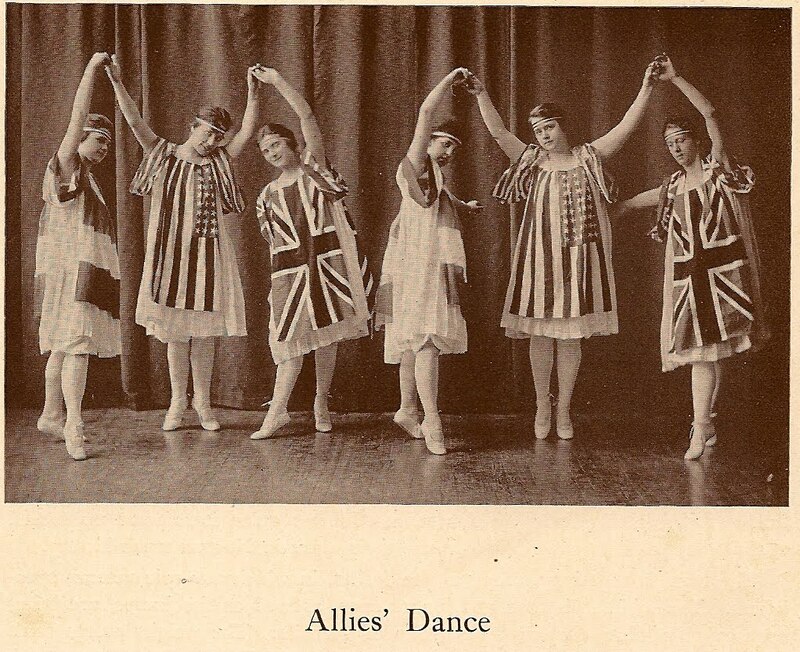 "This year, with our thoughts filled with patriotism, a pretty dance was worked out and costumed to represent the Allies. 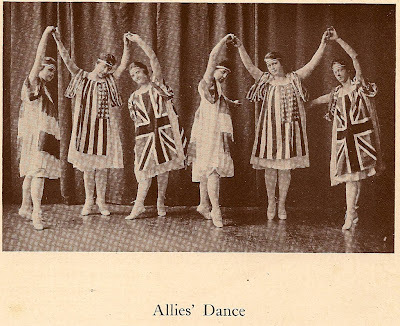 The dance was given at the Middle Western Physical Educational Conference in Detroit, and at the Annual Demonstration here in the Auditorium. The picture gives two of the four groups who presented it." Hwy there, stranger. You've heard about these miraculous "Bohemian Oats"? Let me tell you, they're not all they're cracked up to be. Dusty D finds fascinating this little turn-of-the-century cut from the Normal News depicting the interior of the Banghart meat market at 207 Michigan Avenue (more recently TC Speakeasy's, though there was a street address renumbering around this time that might make the location slightly further up or down the street). 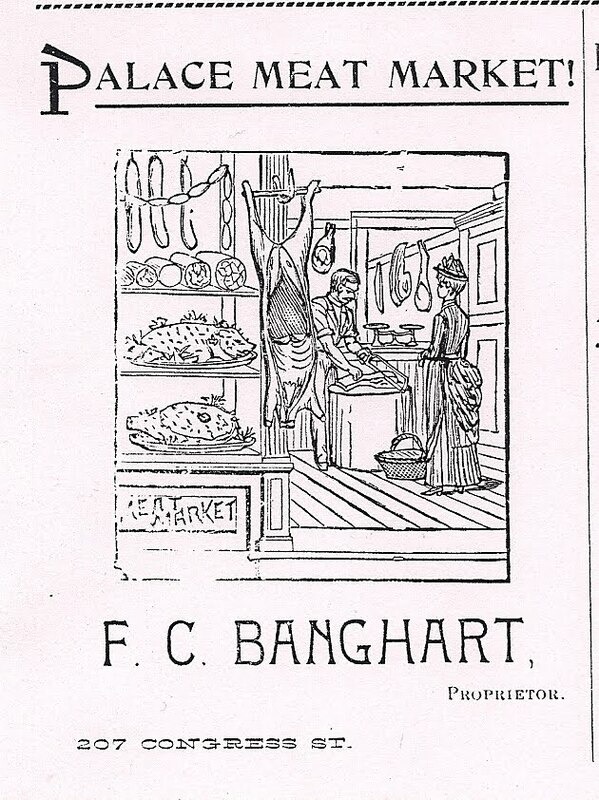 If we assume it is an accurate depiction of the meat market, let's see what you might have seen during a visit. There are some strings of sausages hanging at top left. Beneath them is a line of salami-type deli meats. The largest one appears to be head cheese. Beneath that is a suckling pig, and underneath is what resembles a ham. Dusty D can't tell if these meats are displayed in the open air or if this case is glass-fronted and somehow refrigerated in this era of iceboxes. What appears to be a sheep [?] carcass is hung next to the meats. 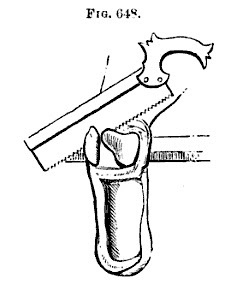 In the rear of the shop, the proprietor uses a hacksaw to saw off part of what looks like a section connected to ribs for a waiting female customer with a basket. 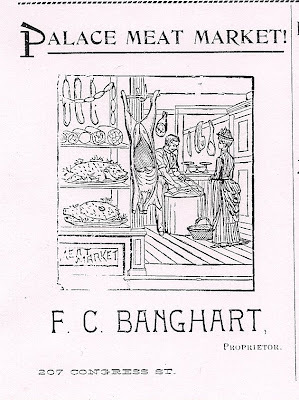 Above the proprietor hangs a ham, with some additional larger cuts hanging in the rear of the shop. These are not refrigerated. If this cut is from around the turn of the century, it's long before the building-wide refrigeration that only started to slowly become more common after World War II, with home AC trailing that. So DD is hoping this meat market had a quick turnover of fresh meats...and that they were cooked thoroughly. Just a heads-up: next week Dusty D will be filming our Honorable Mayor Schreiber chatting about his favorite museum artifact, for the ongoing "My Favorite Artifact" video series. I have no idea what artifact that might be. But I am very grateful that our Mayor is taking time out of his schedule to come down to the museum and talk about an artifact that speaks to him in our wonderful Museum. I find that very generous on his part. I'm really looking forward to it, I'm grateful to Mayor S., and the video should be posted around the weekend after this coming one. "From 1841, when D. A. Church built what was probably the last of the early harvester-threshers, until about 1881, harvesting and threshing were regarded as separate and distinct operations. But when California became the greatest wheat-raising State, labor sufficient to harvest, haul, and thresh wheat in the old way could not be secured. 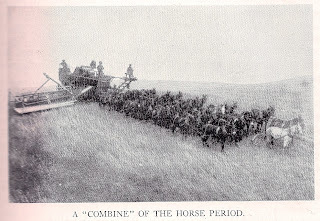 Combined harvesters and threshers ("combines") were built. These were drawn by great teams of horses, as here shown. 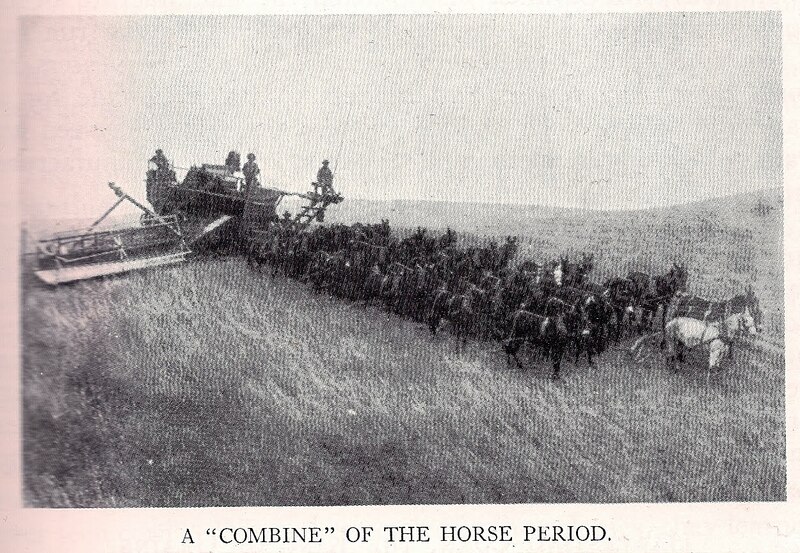 Gasoline-engines were used to supply the power for the machinery, the horses being used only for hauling. nowadays tractors take the place of horses." Saturday March 1st: Cold and windy with a little snow. March came in like a lion. Grandpa bought a little sky[e] terrier to-day for a watch dog. His name is Curly and is very cute. Mama, Eber and I went to the Catholic Church to-night to a Mission Meeting. it was the first time I have ever been inside of a Catholic church and I was very much interested and enjoyed it very much. Mama got me a lovely new dress this morning a very light green embroidered with white linen thread. The church was crowded full when we got there and we had to stand up all the time. There were two Monks besides the priest Father Debiever. Sunday March 2nd: A very pleasant but cold day. Went to church this morning and Mr. Post made us a call this afternoon. I wrote a letter to Abbie Parsons this P.M.
Monday March 3rd: I went up to the Normal Hall to practice with Nora Babbitt. A number of the conservatory pupils were there to practice before the Recital this evening. At four o'clock Mama and I went down to Church and after church the Awnilanis [sp?] had a meeting at the rectory to elect new officers and to vote about working a church house. We elected two new officers: President Margaret Gilbert, Vice president Elinore Woodruff, Secretary Clara Gordspud [sp?] Treasurer Ruth Pease, Chairman of entertainment committee myself. After the society adjourned I rushed home, ate my supper, dressed, took my violin lesson and then over to the recital as I played an obbligato solo for Nora Babbitt. The recital went off very nicely. Tuesday March 4th: It has been snowing a litttle all day. This morning I went over to the conservatory of music and went in all the calsses. Mama and I went this afternoon to the Sappho Club. Wensday March 6th: A very cold day. Mrs. Post came up and spent the day; we had a very pleasant day. Began drawing ice about four inches thick this morning. Thursday March 5th: A pleasant and cold day. Drawing ice. Went down to church and after church the societies had another meeting about the church house but have not decided yet on account of the Chapel Guild not having a comm[ittee] and so did not vote on it at this last meeting and therefore we must wait until next Thursday. Society at Clara Goodspud's. Putting up ice all day. In an age when we are barraged by advertisements, entertainment, and in general constant stimulation it is easy to forget a time when people did more to make their own fun. Or put another way, were more often bored. 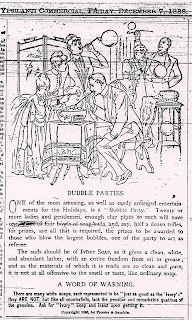 One quaint forgotten entertainment that pops up now and then in turn-of-the-century papers is the soap bubble social. It consisted of just what it sounds like: a bowl of soapy water and some little pipes for blowing bubbles. 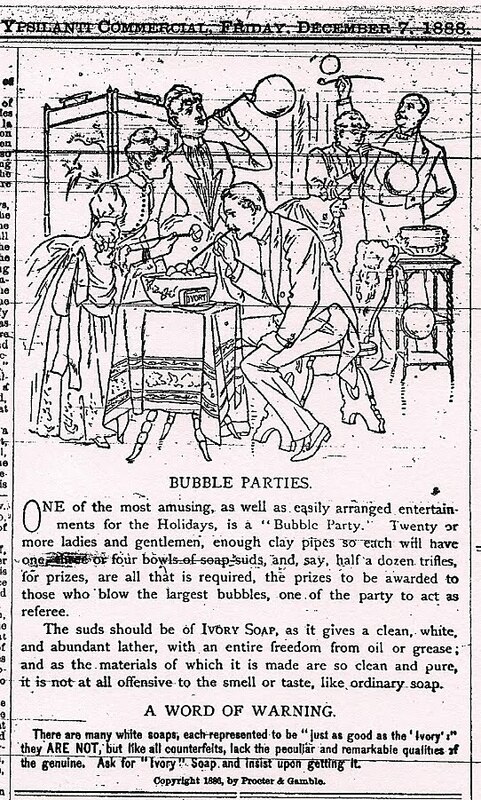 Below are a mention of a church soap bubble social from an Ypsi paper, a description of a soap bubble social from a contemporaneous book, and an ad for Ivory soap from the December 7, 1888 Ypsilanti Commercial. "SOAP BUBBLE SOCIAL: A large bowl of soapy water and a generous supply of clay pipes are the materials required for this social. "The boys divide into pairs and engage in contests to see which can blow the largest bubble. When a boy is defeated by his opponent, he is out of the game and two more contest. This continues until the best blower is found. Three trials are given to each contestant. Here's a tale about a once-famous citizen of Ypsilanti who was paid--lots--for his sexual favors and won awards for his awesome physique...and yet was oh so soft and fluffykins. This story is based on one lone artifact in the Archives....all the other info is from dig, dig, diggin'. A toast, to Macgyver's Clansman. While pecking away at a story I was reading a 1910 issue of the American Poultry Journal and noticed that they have a regular column called "Chick Chats," devoted to readers' "poultry news items." 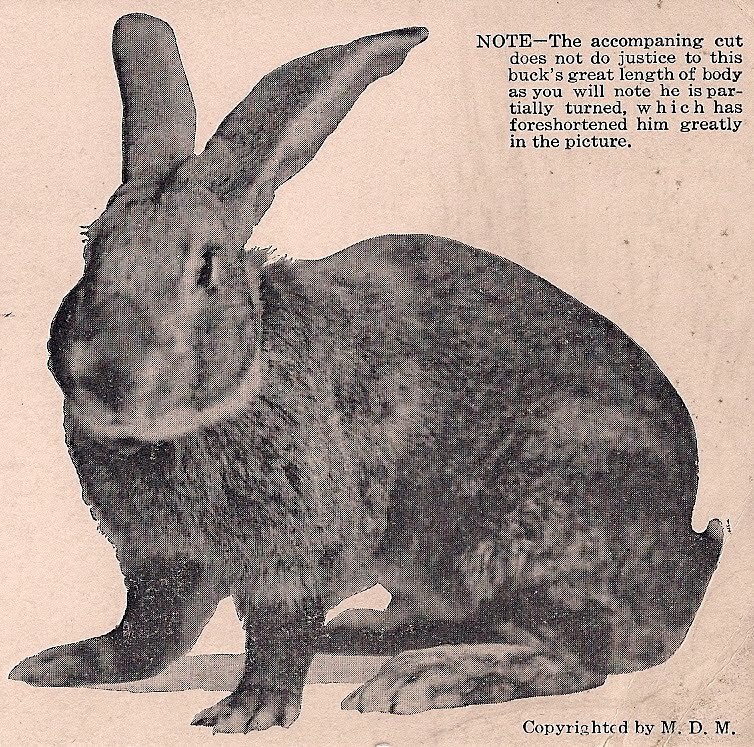 In the early spring of 1909, the city was dealing with a rabies scare. Loose dogs running about town had been an on-again, off-again problem for years, and loose animals in general were an issue addressed by city ordinances dating back to the city's earliest days. Eventually the rabies alert would culminate in at least one dog being shot dead on the street in town. Prior to that, the March 1, 1909 Ypsilanti Daily Press offered the salutary tale of a dog who was doing things right, the tale of Denny. Denny is the homeliest, orneriest dog in seven counties. He is a full-blooded yellow cur with no particular claim to distinction except that he is without doubt the homeliest dog in the world today. 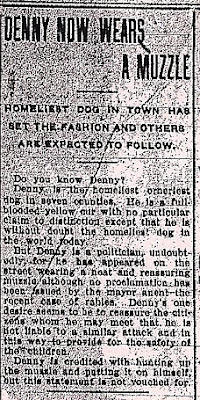 But Denny is a politician, undoubtedly, for he has appeared on the street wearing a neat and reassuring muzzle although no proclamation has been issued by the mayor anent the recent case of rabies. Denny's one desire seems to be to reassure the citizens whom he may meet that he is not liable to a similar attack and in this way to provide for the safety of the children. Denny is credited with hunting up the muzzle and putting it on himself, but this statement is not vouched for. Saturday Feb. 22: It has been very pleasant. Washington's Birthday and the Light Guards were out on parade. Mr. Joe Sanders the Clothier dropped dead as he reached his store door after dinner of heart disease. Sunday Feb. 23: A very disagreeable day; snow and slush. Mr. Post was up and called this afternoon. Monday Feb. 24: Pleasant and quite warm. Heard robins and crows this morning doesn't look much like ice. Had the span of grays (John and Frank) and span of Bays (Pete + Barnum) hitched to one wagon to-day, grays ahead and they went very nicely. Mr. Suderer sent word he was sick and would not be here until Thursday. Tuesday Feb. 25: A cloudy, rainy day. Saw a blue-bird this morning which is the sign of Spring. Richard and mama went to Mr. Sander's funeral this afternoon. Mama, Richard and I went to the Normal Choir concert to-night and enjoyed it very much. Received a letter from Millie Whiting. Made Grandma a visit this morning. Wensday Feb. 26: This has been a damp cloudy day. Margaret Gilbert came over this morning and we went over to the normal to see Nora Babbitt and also visited the music classes. Afterwards she came home with me and we got the horse and went down town and then over to her house. Mama and Grandma went to the Literary Society at Mrs. Sills and went after them at four o'clock and we went down to church. Thursday Feb. 27: Another damp day. After church this afternoon the four Societies of the church had a meeting to talk over the plan of having a church house instead of a chapel and some are in favor of it and others not so there was a pretty lively discussion about it and it was finally voted that each society should appoint a committee of three and meet next Thursday to decide whether we should work for a chapel or a church house. All the societies are in favor of a church house excepting the Chapel Guild and they have the most money and they want a chapel. Mr. Suderer came to-night and is going to stay all night. Friday Feb. 28: It rained this morning, cleared up this afternoon and grew cold. Made Grandma a long visit this morning.